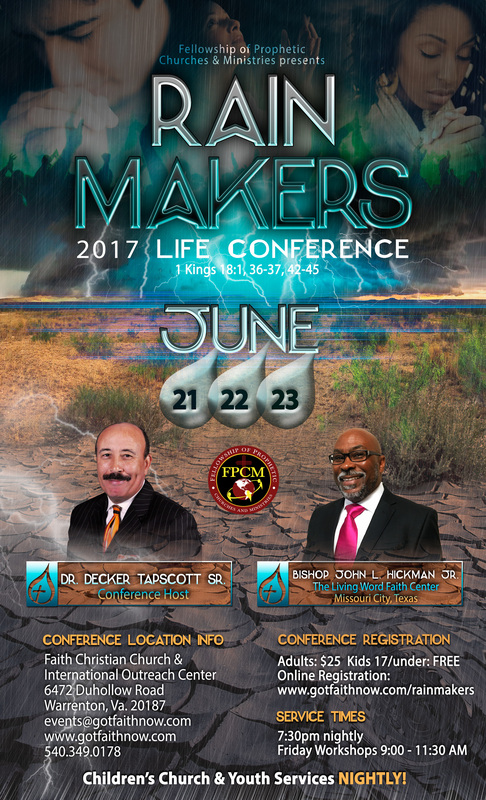 We are excited about The Fellowship of Prophetic Churches & Ministries (FPCM) Life Conference that will be held on June 21-23, 2017; 7:30 PM nightly and workshops beginning at 9:00 AM on Friday. All of these activities will be held at Faith Christian Church & International Outreach Center located here in Warrenton, VA. The theme of the conference is, "THE RAIN MAKERS" [1 Kings 18:1, 36-37, 42-45]. America is in crisis, which is the result of generations of apathy and indifference toward God. Though there has been the claim "In God We Trust", touted about money, in reality polytheism is the flavor of the day. We have not released God of being our national deity. We have just allowed other non-gods to exist along side Him.Out of this environment has come apostasy, idolatry and paganism. The church has become seeker sensitive in its approach; and Grace has become something used to keep living ungodly while applying God's approval. In this chaotic and crisis moment, as it was in 1 Kings 18, God is raising up RAIN MAKERS. They are those who have the spirit of Elijah. This remnant people, who find their Mt. Carmel, (the place of intercession), repair the altar, experience the fire that produces the rain. My prayer is that the fruit from our gathering will spark a deep desire by the Holy Spirit's initiating for the church and individuals to become radical as Elijah in interceding with the expectation that God will move up on the church and the nation with revival. On Wednesday night, Dr. Decker Tapscott Sr. will be opening the conference. Thursday & Friday night we will be hosting our guest speaker, Bishop John Hickman, Jr. of The Living Word Faith Center located in Missouri City, Texas. 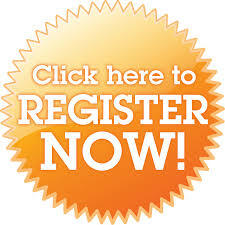 Conference registration will be $25.00 for adults; youth 17 and under is FREE. A specific conference packet will be forthcoming in a separate email. Once you receive it, please take the time to share it with your congregation and encourage them to come. Pastors, if you haven’t already, you may update your 2017 membership fee by contacting Pastor Charles Brooks at 540.349.0178 or email him at pastorbrooks@gotfaithnow.com. The deadline for Registration is June 5. We need you to designate (1) contact person from your church to handle registration. We need their name and contact phone number and email. Please contact Pastor Annie Johnson with this information by emailing her at anniejohnson@gotfaithnow.com or call her at 540.349.0178. She is the contact person for registration for the event. *Please be mindful of the deadline dates for the stated room rates above. If you have any questions, please don't hesitate to contact the church office at 540.349.0178. If you have any questions, please don't hesitate to contact Pastor Charles Brooks, at 540-349-0178 or email him at pastorbrooks@gotfaithnow.com.